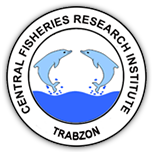 3 Sinop University, Faculty of Fisheries and Aquaculture, Sinop, Turkey DOI : 10.4194/1303-2712-v18_3_13 Viewed : 1427 - Downloaded : 893 In this research, the effects of different temperatures (8, 10, 12, 14, 16 and 18°C) and salinities (5, 10, 15, 18, 20, 25, 30, 35 and ‰40) on the development of turbot (Psetta maxima) eggs were investigated in triplicates. Broodstock produced in CFRI were used in this research. Fertilization, hatching, anomaly rate and larvae length were measured. Time dependent embryonic development were observed. Embryonic development was completed in each temperatures. It is observed that water temperature has significant effects on fertilization, hatching, anomaly and larvae length (P<0.05). Regression analysis showed that there was a negative correlation between the embryonic development and the water temperature of incubation. Time for hatching at 8 and 18°C were 2552 hour/degree and 1350 hour/degree, respectively. Better fertilization rate were obtained in salinities of ‰18, ‰20 and ‰25, respectively. Fertilization was not succeeded in the salinity values of 5‰ and ‰10. The anomaly rate in the salinity values of 15‰ and 40‰ was higher then in accordance with other salinity values.